I think most people take their old cars WAY too seriously. Many guys who won't drive 'em in the rain. Some have to have all the serial numbers correct and all the bolts all lined up and turned to the same angle. Some spend hours cleaning their undercarriage with a toothbrush. All that is definitively not my thing. I believe your special interest car should have some style to it, even if it's outrageous. It should not look like all the other cars. It has to have a "look", and the look has to be "right". Cars are for having fun with, even if it means going to such extremes as building a car as a tongue-in-cheek joke, a parody, which I've done on several occasions (TITANIC '56 Lincoln and WYTRASH '62 T-Bird). Moreover I've never been into speed and power. The motto of DECO RIDES is "styling is everything". Read my MISSION STATEMENT. Not all my cars are jokes, as SCRAPE, the DECO RIDES Boattail Speedster and my present Bugatti/Delahaye quest are downright serious pieces of art. SONNY & CHER CAD: I've developed a fetish for owning pocket battleship sized lowriders. I bought this car in CA, drove it across country, had the car stripped and repainted burgundy Candy Apple and had a beautiful set of metal bubble skirts made for the car. I had hydraulics put the car at the first LEAD EAST in 1983, (this was the first East Coast Lowrider) and eventually sold it to a guy in Tokyo. For more click on SONNY & CHER SAGA. 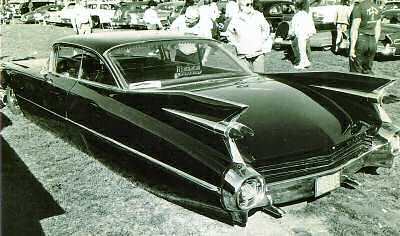 TITANIC: Built for me in the late 90's by Ram's Rod Shop and Bobby Sapp's Upholstery, both in DE, this 1956 Lincoln 2-door was built purely as a joke, a parody of a custom car, with chopped, lift-off top, seven foot long fender skirts and "Liberace Lavender" pearlescent paint. With extended fenders, the car was 20 ft. long. Because any car that is that long is no longer a car but becomes a ship, we christened it "TITANIC". 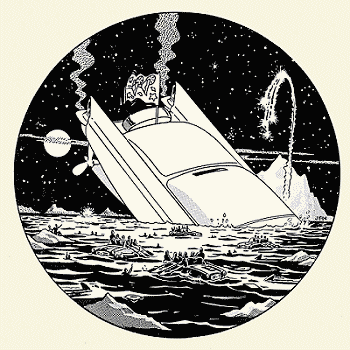 The art on the continental kit shows a '56 Lincoln custom going down at sea after striking an iceberg. Look close, the small lifeboats in the artwork are Nash Metropolitans. Before it was sold at the auction at Pebble Beach in 2000, in late 1999 I fulfilled one of my dreams by touring England with the car for two weeks, then 5 days in Paris, then drove it through Belgium to two major shows in Germany. Click on TITANIC for the story of EUROPE BY LOWRIDER. Sold to a guy in Fl. LEE PRATT'S '41 BUICK: Probably the first street rod to ever be equipped with hydraulics, I first saw Lee Pratt's two tone purple Buick Sedanette in Des Moines at a KKOA event in the 70's. It was then and remains today as one of the "killer" customs of all time. I puuchased the car in '91, had it totally restored and drove the wheels off of it (NJ to Miami twice, to ME and to the Mississipi river). 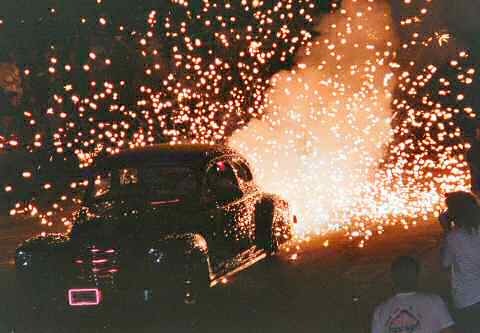 I sold it a few years back and had more fun in that car than the law allows, including the time I silver taped Roman Candles to the tailpipes at the (last) LEAD EAST Flamethrower Contest. Decorated by the late Reverend Mike with Christmas tree lights and revolving disco ball interior. See HAVIN' FUN IN LEE PRATT'S '41! Sold to a guy in TN. WYTRASH ZEBRA BIRD: Another custom built purely as a parody of customs, Dave Smith of Arcanum, OH chopped the top adapting a '60 Caddy lift-off roof on my '62 T-Bird. Don "The Egyptian" Boeke of Dayton applied the zebra-skin scallops with aqua pinstriping outline. When I applied for the personalized license WYTRASH, the state of NJ refused my request because they felt it was in bad taste. Sold to a guy in WA. For more click on JERSEY TO PASO.